So uh…all that busyness last Morostide and at Luminaire caused a bit of extra traffic through Shadowglen woods. My ghost friends and I really prefer the peace and quiet and so we took a new route. The thing is, we sort of came across this hill, and then a dip. There were some stones that we climbed over and we came to this place that felt both old and new at the same time. And this creature was right there to greet us! Aren’t they wonderful? They’re so very friendly, and they love to have their bellies scratched. They made a weird cute sort of noise that sounded like ‘ururururururu’ so I’ve been calling them urubus while I went to figure out what they actually were. The thing is, Ian and Jaxon came out with me to see them, and we’ve done some research and it appears I may have discovered a brand new species! We had so many of them follow us home for belly scratches that we made some calls to the Pet Agency who have agreed to connect them to new human companions, which they seem to love! Please welcome the urubu to Subeta! You may need to put a fence around your vegetables, they do like to dig things up. I don't understand why everyone thought it'd be a vulture tbh. I understand the name is Vulture in Portuguese, but we already have the Fester, and Subeta has always tried not to use real names for their pets. I'm personally not a big fan of these guys, but I'm glad that there's a new pet on Subeta. I can't wait to see them in some different poses and colors beyond the base ones. That might be kinda neat. A lot of other people seem pretty stoked about it so I'm happy about that as well. Great art too. 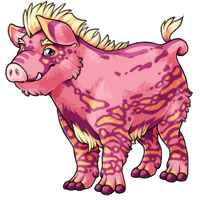 Albert Einswine may end up being my favorite pet. These things are so cute! When I saw "Welcome to the Urubu", I thought the pet would look like a vulture, since those are called urubus in Portuguese. Still, a cute species, just got really confused for a moment! Looks like a neotenous wild boar. I approve (although I co-sign the bit regarding the name meaning vulture). I'm a little puzzled about why no one researched the name - they'd have learned that black vultures are called urubus in various languages, such as french and portuguese, but it's a cute pet. Yay! What a fantastic way to celebrate the year of the pig! Now my pet, Napoleon, can have a species better suited for his character! I need Urubu elixirs like last week, this is perfect for my pet Walda! All I can see is Bebop from TMNT, which is the best thing ever. I feel like the angelic version of this is going to be really awesome. Really though, these are some high quality boars! :D I like their mohawks and fancy fur pattern~ I may actually make one. I know one cute boar from a game that might be fun to add to my collection of too-many-pets. So now can we have more colors for Scootles and Blobs??? Please? Oooh can't wait to see the special colors for them! GET ON MY LEVEL, PLEBS! So cute!!! I agree with @Mad, I am psyched for some piggy poses! Love them!!!!! Piggies don't get enough love!!!!! I knew we'd get something for the Lunar New Year - but I didn't expect a brand new pet species! Nice! Omg just in time for the lunar new year, year of the pig!! S O C U T E i love them SO much!!!!!! I really do like these peegs and am happy we finally have peegs. I'm just glad I barely have to say subeta stuff out loud because "urubu" is really awkward and weird for me to say. @PaisleyAnn Yay! I was hoping there would be piggy pet one day! *squeals, bounces and flaps hands* They are so cute!! As soon as I think of a good name, I am definitely going to get one of these. I will make it either marsh, common or aqua, and I will give it many belly scratches. They look like my dog. Great, I just had to go an adopt two LMAO! They're too cute! Looks like the lil cinghiale we see in Italy. Albeit not as huge and scary lol. LOVE these. What an awesome pet! Love their markings, it translates really well into all the base colors (though I gotta say the Vibrant Urubu is by far my fave)! Definitely keeping an eye on this species, I know the other colors are gonna be stellar for this one! Piggyyyy! Immidiately had to run out and make a silver one! HAD to adopt one and turn it cream. <3 Yayyyyy! The cream one is SO adorable I love him! I thought of Kagura from fruits basket when I first saw these. 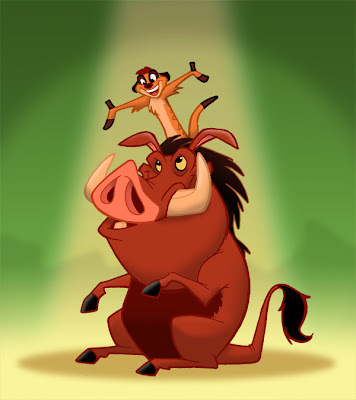 So when do we also get Timon HMMMM?!?! This is so out of the blue (for me), but completely welcomed! This is awesome! Oh my goodness, they're so cute!! I have a perfect little empty pet slot available, too... Happy year of the pig! YES!!!! YES YES YES YES YESSSS!!!!! 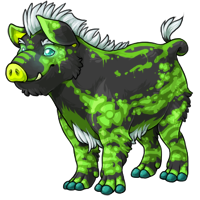 I've been waiting 10 years for a piggie type pet, and this was worth the wait, it's PERFECT! Timing of release couldn't be more perfect too. Happy Lunar New Year everyone and THANK YOU whoever designed the Urubu! They're cute! I can't wait to see how they look in other colors! In the meantime, I updated my pet color spreadsheet! YEEEEEESSS THE PERFECT PET FOR BACON. THANK YOU AAAA. Awwww....Bacon pets! Really like the aqua and the dusk. YES YES YES YES THANK YOUUUUUUUU! Are these zappable? Please tell me these are zappable! Mabel made me do it. Oh how cute and sixteen different colors too! Awesome! Year of the Pig (Boar works too)! Now we definitely need some kind of prehistoric, ancient pet colour so we can have a woolly, sabertooth Urubu! And here we are! Love it! When will the potions be ready? Or are they still brewing? Piggy!! I'm so excited for the future potential of a chibi one and free reign to call it a squeaker! @emrah You have 20 dog-like pets, so why not a pig-like one? Yesyesyes I adore them!!! ? Not looking for another pet and not in to pigs but I like the story, very cute. Still, I was waiting for a pig pet thanks! oh my goodness!!! i can't wait for more colors, their tiny tusks are adorable but i'm excited to see colors like nightmare with (hopefully) big intimidating ones ^^ can't wait for spooky pigs!!! Eeeee so cute!! Also QUENTIN WE LOVE YOU. <3 Seriously adorable. Oh my goodness would you look at these darlings @TESSIE79! Pumba from lion king was the first thing I thought of when seeing this new pet! !!! I can't wait to see them in more colors! Piggy pets! <3 I love them already! Me seeing "new news" at the top of the page: Is it a pig? I BET IT'S A PIG. And so the alphabet is complete. Year of the Pig! Of course! I love the common color, it's so unique for a Subeta pet. These are super cute! I love their markings. 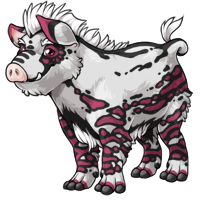 I can hardly wait for it to be "chibified"
Yesssss finally, a pig pet!!!! Aww, how cute! 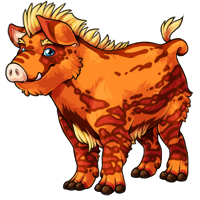 Everyone's saying Pumbaa but I kind of want a Ganon fan pet x) Maybe if/when they can be Nightmare. Finally the right species for Pignite! YYYYEEEESSSS!!! 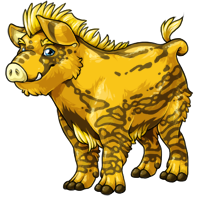 I've been wanting a pig/boar pet since forever and I kept hoping -- what with this being the Year of the Pig and all -- that it might finally happen. AHHH!!! I love them so much!! I can't wait to see what the other colors will look like (I bet chibi will be especially cute) but absolutely need to adopt one immediately. Gah, lookit the wittle tusks. SO CUTE! Well, these goobers have potential. Can't wait to see some of the special colours for 'em. This is not an Urubu, this is a Javali (sorry, I couldn't keep it to myself lol)!! YAY! Not only do we have a piggy pet now but we have a pet that starts with U finally. The whole alphabet is now represented! I really like the arid and cherry. I can't wait to see special colors for these guys! WHAAAAAAT!!!! AAAAH SO CUTE i can't wait to see someone name one puumba!! Such an awesome looking pet! Love the tapir-like markings! @Staff can the chibi one please have a light pink color? You have just adopted Urubu the Urubu <3! I don’t think it is halal or kosher to own a Urubu. Well, if that's not a Bebop, I dunno what is. And there's already a Rocksteady. What a pleasant surprise on the first day of the year of the boar! Thank you, subeta! Can't wait to see the awesome designs for the special colors for these guys! I sure wasn't expecting a new pet species now, what a surprise! And I adore it! I wonder if I can find room for one among my pets somehow. Guess I know what's going in my next pet slot! I was extremely confused when I read the notification and this turned out to be a boar pet rather than a vulture/bird of prey pet LMAO Way to get your portuguese-speaking subetans! The darker stripes on the Gold and Sun ones look strange to me. On the other colors they're always a lighter contrast, so my brain wants the Gold one to have nearly white light yellow stripeys. They're so cute! I need one! I need one! But I haven't got any room. You actually made the wild boar pet. Yay! I really like the colors on the common one. Quick, Runes, think of a name. omg what, they are so cute?? "They made a weird cute sort of noise that sounded like ‘ururururururu’"